"Let's try the sofa here. No, maybe over there?" "The furniture is this way because that's the only way it works." 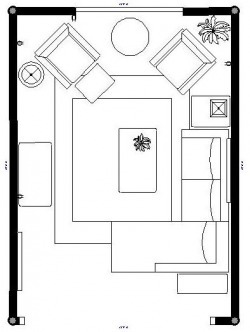 "This apartment is a lot smaller then my last one. I'm not sure how I can get my stuff to look right." Any of this sound familiar? There are no right and wrong answers when it comes to design, but there are some ways that are better than others. I can save you a lot of time and energy. CSD will provide you a choice of 3 floor plans for to choose from to implement on your own or, if you prefer, handle the rearrangement for you after the floor plan has been approved. Prices start at $100 for floor plans only. Email for more information or schedule an appointment.